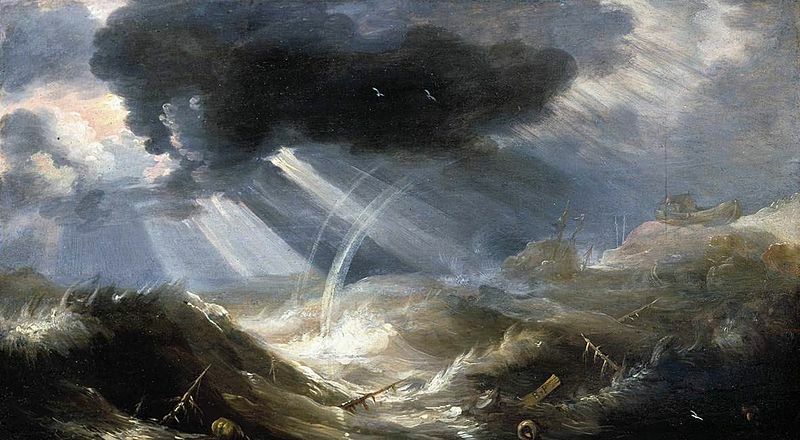 The story of the Great Flood, or Deluge, is one which appears in the religious stories of many different faiths. It is also a story that appears in Greek mythology, where it is a tale particularly associated with the survival of Deucalion and Pyrrha. Deucalion was a son of the Titan Prometheus and the Oceanid Pronoia (also known as Asia), whilst Pyrrha was the mortal born daughter of the Titan Epimetheus and Pandora. Deucalion and Pyrrha would wed, and Deucalion would become a king of Phthia in Thessaly. Deucalion and Pyrrha lived in the Bronze Age of Man, the third age of man after the Gold and Silver Ages. It was a troubled age, for it was the age of man when the world’s evil had been released, after Pandora had looked inside her wedding gift. The population increased and impiety and wickedness overtook man. The final straw for Zeus was said to have been the actions of King Lycaon, for the Arcadian king had killed and served up one of his own sons as a meal, in order that the powers of Zeus could be tested. Lycaon and his remaining sons were turned into wolves by Zeus, but the supreme god also decided that it was time for the Bronze Age to come to an end. 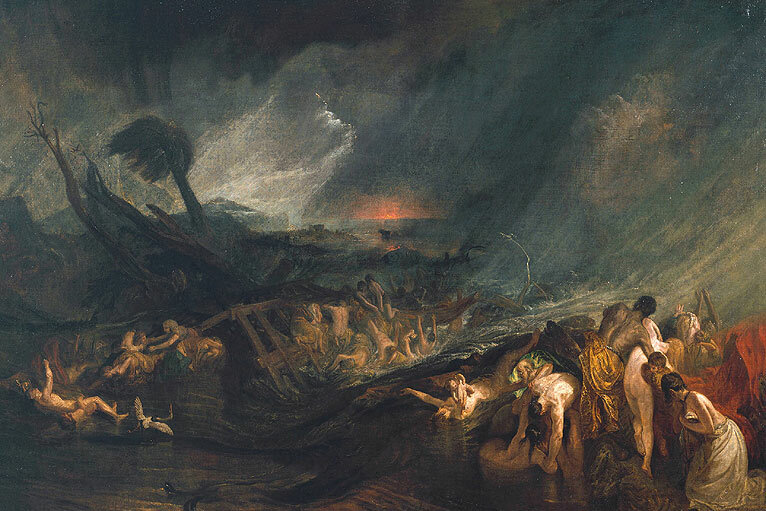 Zeus decided that the manner of the extinction of man would come in the form of a great flood. Deucalion was warned about the plans of Zeus by his father Prometheus; for Prometheus was the Titan of Foresight. Thus, Deucalion and Pyrrha constructed a ship, or giant chest, and provisioned it with food and water. When Zeus decided the moment was right, Zeus shut away the North Wind, Boreas, and let Notus, the South Wind, bring forth rain; the goddess Iris feeding the rain clouds with water. On the earth, the Potamoi were given free rein to flood the land, breaking their banks in numerous places. Water levels rose, and soon the whole world was covered in water, and man was virtually wiped out. At the same time, animals and birds also died, for there was nowhere for them to find sanctuary either, and only the sea life flourished. Deucalion and Pyrrha though survived, for as the water levels rose, they boarded their ship and floated away from Thessaly. For some time, possibly nine days and nine nights, Deucalion and Pyrrha floated in their ship, and whilst Zeus observed the survivors, the god decided not to do anything about the pair who were avoiding his retribution, for he perceived that Deucalion and Pyrrha were pious and pure of heart. The waters continued to recede, and soon the earth was back to its previous state, and as the water receded new flora and fauna burst into life. Deucalion and Pyrrha offered up prayers to Zeus, thankful for their delivery for harm, but finding themselves alone on the earth, they sought guidance on what to do next. Deucalion and Pyrrha visited the shrine of Themis, and prayed to the goddess of law and order. Themis responded to their prayers, and commanded Deucalion and Pyrrha to leave the sanctuary, and as they walked away they were to cover their heads and throw the bones of their mother over their shoulders. Now the meaning of the words of Themis was not immediately clear, but eventually Deucalion and Pyrrha came to realise that the bones of their mother were actually the stones of Gaia, Mother Earth. Thus, it was the stones that were thrown by Deucalion and Pyrrha, and from the stones thrown by Deucalion came men, and from the stones thrown by Pyrrha came women. Deucalion and Pyrrha also had children born in a more conventional way. Three sons were born to Pyrrha, Hellen, the ancestor of the Hellenes people, Amphictyon, a future king of Athens, and Orestheus, a king of the Locrians. Deucalion and Pyrrha also had three daughters, Pandora, Protogenia and Thyla. 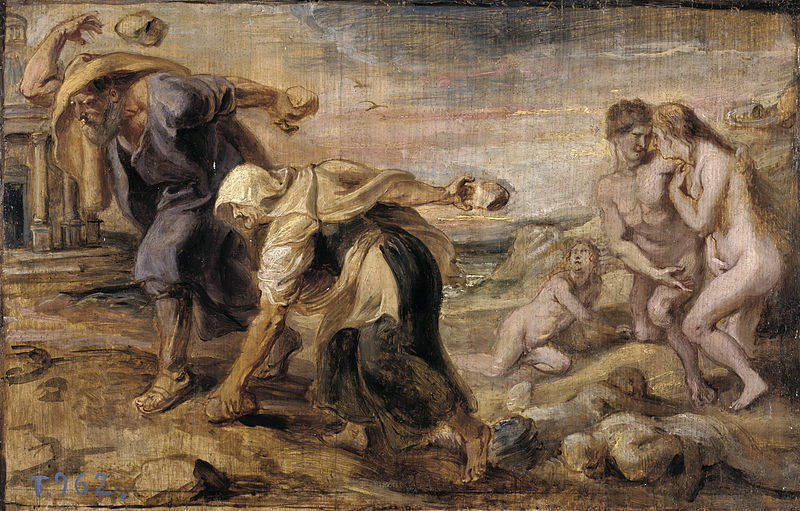 All three of the daughters of Deucalion would become lovers of Zeus; and as a result, Pandora gave birth to Latinus and Graecus, the eponyms of Latin and Greek peoples; Protogenia, was mother to Aethilus the first king of Elis, Opus and Aetolus; and Thyla was mother of Magnes and Macedon, the eponyms of Magnesia and Macedonia respectively. In the myth of Deucalion and Pyrrha, husband and wife were the sole survivors of the Deluge, but in other stories from Greek mythology, other survivors are also mentioned. Megarus, a son of Zeus, was said to have found sanctuary on top of Mount Gerania, when guided by the flight of some cranes. Megarus would subsequently become ancestor of the Megarians. Similarly, Dardanus was said to have survived to become ancestor of the Dardanians (Trojans) in Anatolia. Deucalion and Pyrrha might not have even been the only survivors upon Mount Parnassus, for it was also said that the people of Delphi were guided to safety upon the mountain by the howling of wolves.